The revered Iron Chef shows how to make flavorful, exciting traditional Japanese meals at home in this beautiful cookbook that is sure to become a classic, featuring a carefully curated selection of fantastic recipes and more than 150 color photos. Japanese cuisine has an intimidating reputation that has convinced most home cooks that its beloved preparations are best left to the experts. But legendary chef Masaharu Morimoto, owner of the wildly popular Morimoto restaurants, is here to change that. In Mastering the Art of Japanese Home Cooking, he introduces readers to the healthy, flavorful, surprisingly simple dishes favored by Japanese home cooks. 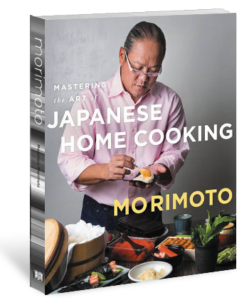 Chef Morimoto reveals the magic of authentic Japanese food—the way that building a pantry of half a dozen easily accessible ingredients allows home cooks access to hundreds of delicious recipes, empowering them to adapt and create their own inventions. From revelatory renditions of classics like miso soup, nabeyaki udon, and chicken teriyaki to little known but unbelievably delicious dishes like fish simmered with sake and soy sauce, Mastering the Art of Japanese Home Cooking brings home cooks closer to the authentic experience of Japanese cuisine than ever before. And, of course, the famously irreverent chef also offers playful riffs on classics, reimagining tuna-and-rice bowls in the style of Hawaiian poke, substituting dashi-marinated kale for spinach in oshitashi, and upgrading the classic rice seasoning furikake with toasted shrimp shells and potato chips. Whatever the recipe, Chef Morimoto reveals the little details—the right ratios of ingredients in sauces, the proper order for adding seasonings—that make all the difference in creating truly memorable meals that merge simplicity with exquisite flavor and visual impact. 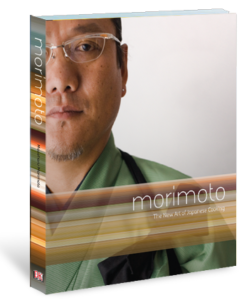 In 2007, Morimoto published his first cookbook, Morimoto: The New Art of Japanese Cooking, winning two IACP Cookbook Awards and a James Beard Foundation Award Nomination. Morimoto’s unique cuisine is characterized by beautiful Japanese color combinations and aromas, while the preparation infuses multicultural influences such as traditional Chinese spices and simple Italian ingredients, presented in a refined French style. Bringing all these elements home, with helpful step-by-step instructions and gorgeous photography, this accessible book explains Chef Morimoto’s cooking techniques and plating philosophies and brings Japanese cooking to your own home.